First filed for in 2011, Apple's "Handwriting capture techniques" describes a set of rules used to render a digital replica of a person's handwriting, or more specifically, how a touch-capable device translates user input into a representation visually similar to handwriting. A set of rules is used by a processor of a device to render a digital image of handwriting (e.g., handwritten signature) by connecting data points captured on a touch sensitive surface of the device with line segments or curves. The patent looks to solve the problem that arises from collecting and processing a multitude of input data, in this case touch event points, which can be difficult if a stylus or finger is quickly moved across a touch sensitive surface. Tailored for "devices capable of capturing only a few signature data points per second," the invention allows for a more natural representation of a signature or handwritten line when the number of given data points would otherwise be inadequate. For example, many parcel delivery companies employ a portable signature capture device to facilitate quick and secure service. Usually, the device lacks the processing power to capture enough data points to display a smooth and continuous representation of a customer's handwritten signature. 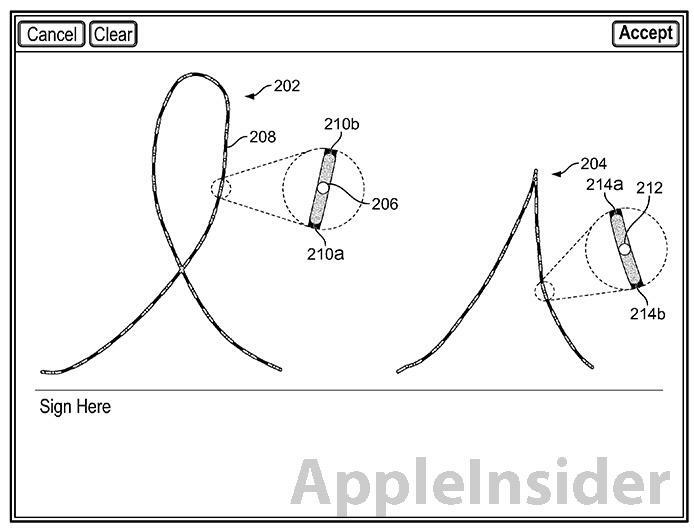 To overcome this apparent inadequacy found in some devices, Apple's patent leverages a predetermined set of rules to connect the space between two input points by a either a line segment or curve. If the device determines that a curve is needed, a "smoothness adjustment factor" is applied to reduce or maintain smoothing depending on the length between said input points. Key to the system's functionality is the calculation of velocity and direction, both of which are used in tandem to determine whether a straight line or curve is rendered between two points. It is important to note that Apple's patent can be implemented for both stylus and finger input, meaning the invention is suitable for devices like the iPad. There are a number of apps currently on the App Store that take advantage of the iDevice's touch input system to reproduce handwriting, such as Square's credit card system and various drawing apps. 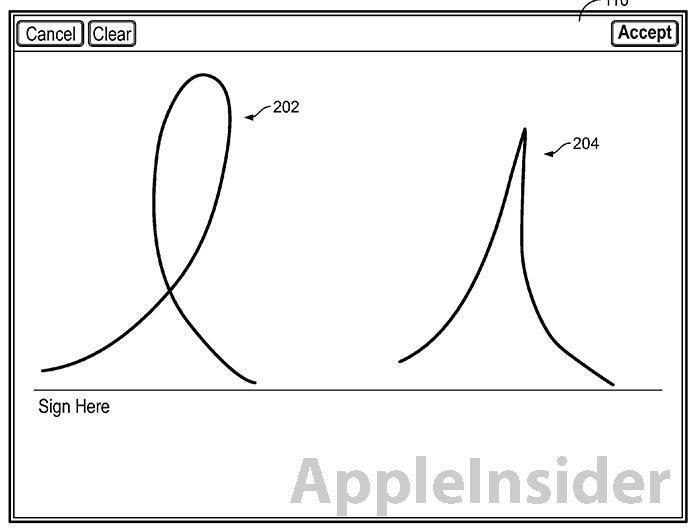 The second touch-related application published on Thursday was Apple's "Region Activation for Touch Sensitive Surface," which describes a system in which extraneous touch events recognized outside of so-called "active regions" are ignored. 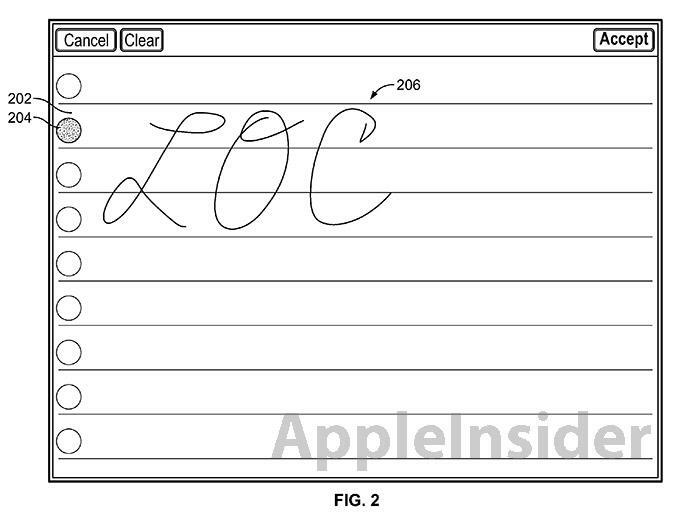 Apple's invention fits perfectly with the handwriting recognition patent described above. As described in the filing's background, when a device is capturing handwritten notes or signatures, a user is apt to rest their palm on the touch sensitive surface for support. This can cause errant touch events, triggering unwanted results. To avoid such inadvertent touch input, the user can elevate their hand above the touch surface when writing. This workaround can be awkward and tiring to the user. The application suggests that by defining "active regions," inadvertent touch events can be avoided. A region, or regions, can be activated by the user, and any touch event starting in that area is logged and displayed on screen. Touch events not started within the active region or "not associated with the beginning touch event" are ignored. A number of implementations are described, one of which contains a visual element like the lines of a virtual notebook that corresponds to the underlying active region. In this example, an indicator denotes where writing input can be entered. Once initiated, the writing gesture will continue to be logged until the user interrupts the process by lifting their finger or stylus from the touch sensitive screen. When writing is complete, the displayed input can be saved on the device for later use. Another example notes that haptic feedback can be used in lieu of visual indicators. Both of Thursday's patent applications credit Lyndley Crumly as inventor, with David Clark in the handwriting recognition invention, and were first filed in April 2011.